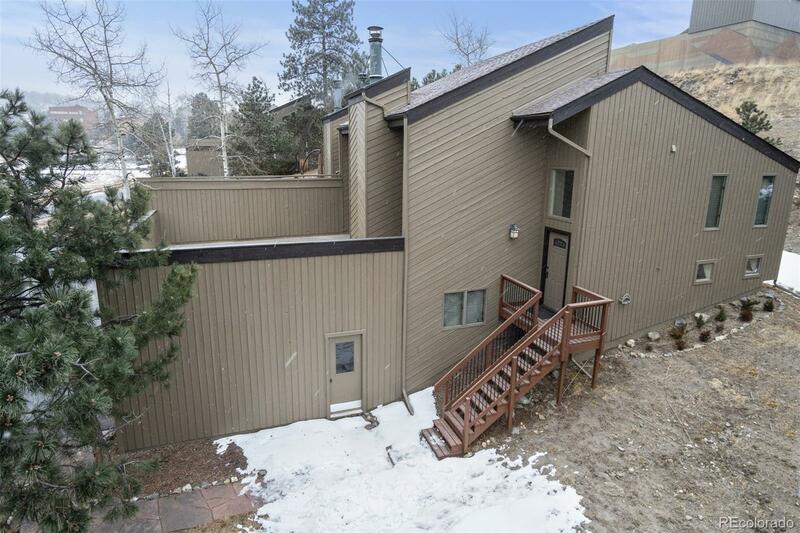 Spacious and affordable Sun Creek townhome, centrally located in North Evergreen close to shopping, RTD bus, and trails. Great Room style living features a vaulted ceiling, and wood burning fireplace - so warming on chilly evenings. Sliding glass doors lead to the huge rooftop deck with views of Bergen Peak. The nicely laid out kitchen features solid surface countertops, oak cabinets, eating bar and close access to the dining and family rooms. From the family room a slider offers access to the backyard. There is a main level laundry center with included W&D. The amply sized master bedroom features an adjoining full bath. On the lower level there is a second bedroom, full bath, office/den, bonus room plus a sizable unfinished areaâgreat for storage or workshop/studio. The 2 car garage is amply sized and recently updated with quiet overhead door & opener. The driveway is paved and offers guest parking.